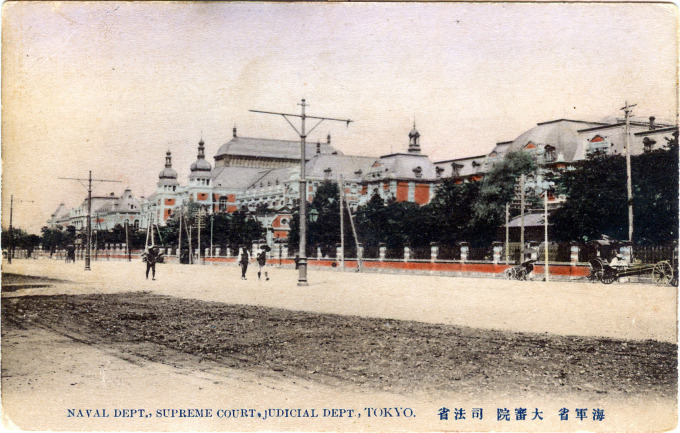 Judicial Department (Ministry of Justice), Kasumigaseki, c. 1910. The ornate Meiji-era building remains in use today as the Justice Ministry, having survived both the 1923 Great Kanto earthquake and the Tokyo firebombings of WWII. “Even by modern standards the Ministry of Justice is daunting. It has a facade 133 meters (436 feet long), and massive construction using the most modern methods of its day: wrought iron I-beams, deep foundations, arched metal supports between floors, a sloping stone base, and iron banding of the brick exterior. Such concern for stability preserved the building in the 1923 earthquake. “The bricks themselves were specially made to exacting German standards. (The site of the Germans’ mechanized kiln can still be seen at Fukaya in Saitama Prefecture.) This smooth exterior brick began a trend toward polished brick that was to flourish in late Meiji construction. 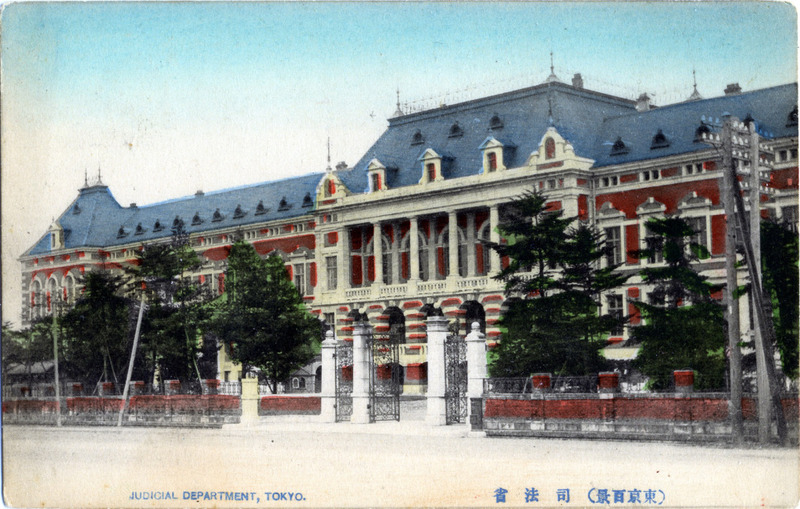 “The two favorite styles of Meiji Western architecture were ‘Renaissance’ and ‘Baroque’. The Ministry of Justice probably stimulated both tastes by being somewhere between the two, while the Great Court next door, undamaged by war but demolished in 1975, was dramatically ‘Baroque’. The Ministry of Justice, faced with red brick and trimmed with white granite, has a wide central pavilion with larged arched windows and a second-floor loggia supported by white Tuscan pillars. On either side of the facade are lesser doorways will pillared porches. Map: Government ministries locations, ca. 1905. “… Originally, the central pavilion and those at either end had copper and slate mansard roofs with pedimented dormers and metal cresting, while peaked roofs covered the two stairwell towers in back. All the roofs were lost in the firebombing of March 1945, which gutted the interior and left standing only the formidable walls and foundations. Government ministries ca. 1910 along one side of Sakurada-dori (from far left to right) nearest the Imperial Palace: the Justice Ministry (Shihōshō), the Supreme Court (Taishin), and the Navy Ministry.